Kafoury hopped on a scooter for the first time on Tuesday. What would Portland politicians be without social media and e-scooters to help make them cool and relatable? 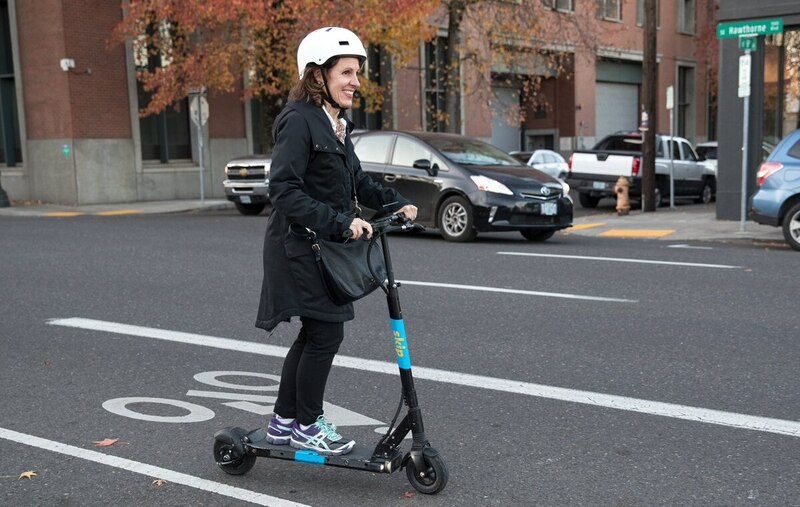 This November, canvassing door-to-door via electric scooter was popular among Sen. Shemia Fagan (D-Ore.) and Republican candidate for Oregon House District 51, Lori Chavez-DeRemer. Both touted e-scooting-out-the-vote on Twitter and Facebook. Related: Fagan scoots out the vote, and DeRemer's consultant emails to let us know she was doing it first. Yesterday, Multnomah County Chair Deborah Kafoury capitalized on the trend with her own tweet. "First time on a scooter!" she wrote, with a photo of her on a Skip scooter. Kafoury's inaugural spin comes just in time—one day before the end of the city's four month scooter pilot program. As Portland Bureau of Transportation prepares to debate the long-term viability of scooters in Portland, Kafoury's portrait of a responsible rider—she's wearing a helmet and rolling down a bike lane—could be read as an endorsement for the new form of transit. E-scooter operator Skip appears to agree. The company wrote in a response to her tweet, "Great form! We hope you enjoyed your ride." Others were more critical. One Twitter user commented, "Careful, we got a broken arm from one of those!" Adding later to Kafoury's assurance that she went "very slowly,": "I guess you went more carefully than my 20-year-old son." Kafoury says it was just a joy ride, not a policy statement. "I just wanted to try these scooters I see zipping around town," she says. "But I also wanted to make sure that I was obeying the law by riding in the bike lane and wearing a helmet." Whatever your opinion is on Portland becoming the next Scooterville USA, today might be your last day to join Kafoury in feeling the frigid wind in your hair. Just remember: Stop lights exist for a reason and sidewalks are still off-limits.